FANBOY PLANET.com . : db-curtsies-and-conspiracies :. Set in the same universe but several years before Gail Carriger's Parasol Protectorate series, her latest novel continues her Young Adult Finishing School. What makes these books belong in Steampunk are the vampires, werewolves, dirigibles, steamships, guidance valves, and mechanical servants. But Carriger has way too much fun naming the machines. Electrosplit goopslimer port? Thrushbotham pip-monger swizzle sprocket? Really? The heroine, Sophronia, is a spunky pre-teen who is the youngest of a large family and is sent away against her wishes to finishing school in the first book. She thinks she’ll hate it, but discovers that the school is a finishing school for spies! Since Sophronia is intelligent and not afraid to go where she’s not supposed to, she has a natural bent for the spy business. Of course, the ladies still need to be ladylike and part of their classes cover that as well. In this area, Sophronia still has much to learn. Both books feature mysterious actions by adults to be solved by Sophronia and her girlfriends on the Finishing School giant dirigible. But the books also have the angst of pre-teens and teens growing up—the gossip and backbiting among the girls and the flirting with the boys in another school. And this is what makes these books so appropriate for the Young Adult market, but the books never talk down, which makes them interesting reading for adults. The writing has a sense of humor that is enjoyable. We even get to meet some of the characters that are part of The Parasol Protectorate series. 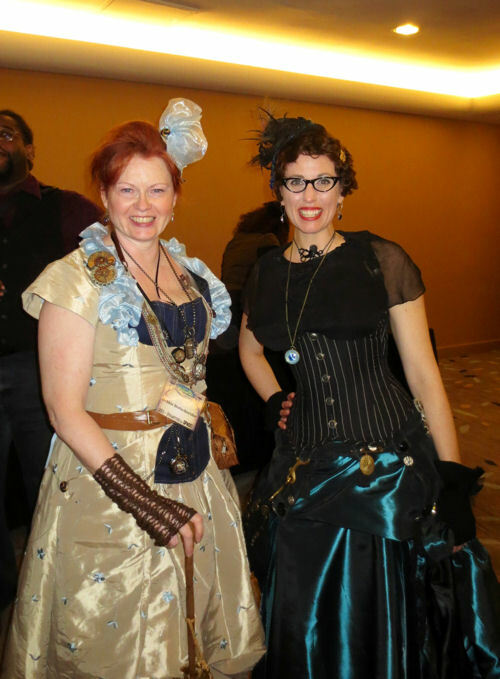 And the adventures seem to be doable in a Steampunk kind of way. 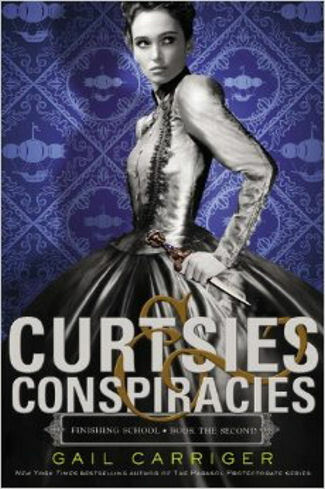 Curtsies & Conspiracies is available on Amazon for pre-order and is released on November 5, 2013. The next book is titled, Waistcoats & Weaponry.